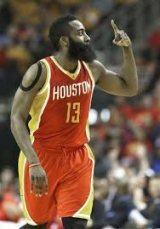 HOUSTON -- The Houston Rockets used a 40-18 first quarter burst to upend a well-rested Oklahoma City Thunder, 112-101, on Thursday night at the Toyota Center. James Harden led Houston's balanced attack with 31 points, 10 rebounds and nine assists. Trevor Ariza had 17 points and four steals while Jonas Motiejunas tallied 14 points and four boards. Dwight Howard, Patrick Beverley and Josh Smith each had 13 points for the Rockets, who made 41 of 86 percent from the field (47.7 percent) and 16 of 36 from above the 3-point line (44.7 percent). It was a good bounce back win for the Rockets, who bowed to the Orlando Magic, 120-113, on Wednesday night. OKC, which came off of a five-day layoff, got 24 points from reigning MVP Kevin Durant's 24 points on 8-for-12 shooting. But it wasn't enough spark to beat a well-rounded Rockets team that is 14-6 at home and 28-12 overall. Russell Westbrook finished with 16 points and eight assists for the Thunder while Reggie Jackson pitched in 16 points, six assists and six rebounds, but OKC struggled on the field, making only 35 of 81 shots. "We got to do a much better job and with a sense of urgency, we can't give a high power offensive team a lot of easy looks" Thunder head coach Scott Brooks told reporters during his post-game press conference..
Photo: James Harden's 31 points was more than enough to power the Houston Rockets past the OKC Thunder, 112-101, at the Toyota Center.